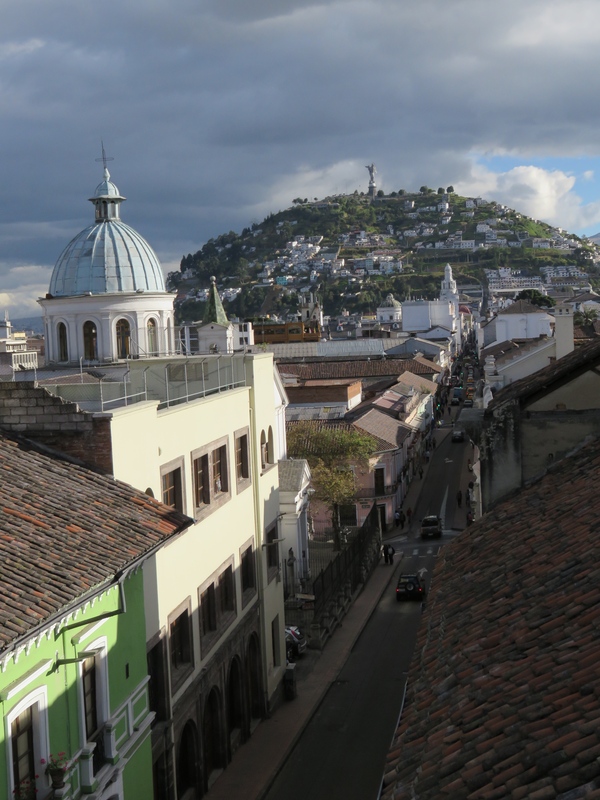 During the summer I had the chance to travel and work in Quito – Ecuador. In my case, it was also a chance to go back home, to put into practice what I learned in my first year, and to see it all applied to a different city, my city. One of the perks of traveling home for the summer, besides working in the office that regulates and designates all the historic areas and built heritage in the metropolitan area, was being able to learned first hand how preservation works there and how what I’ve learned so far can be adapted and used. The night pictures are from “La Ronda” – a recently restored neighborhood and the middle picture is “El Panecillo” – the little mountain that separates the city’s historic center and north from south, and “La Virgen de Quito” on top of it (built 1975). During the six weeks that I worked in the Historic Areas Department of Quito’s Municipality I got the opportunity to help with different tasks, and although most of them were related to permits and project supervision, I also got to be part of field trips and visits, and training conferences about the city’s planning and its objectives for the UNESCO designated area of the city. Quito was designated World Heritage Site in 1978. According to UNESCO “the city has the best-preserved, least altered historic center in Latin America,” which in addition to the unique examples of the fusion of Spanish, Italian, Moorish, Flemish, and indigenous art in the “Baroque School of Quito” within churches and monasteries have made of the historic downtown not only a touristic attraction but also have shaped the identity and lifestyle of the people who live or work within its limits. However, in order to be part of UNESCO’s World Heritage List, the city’s municipality must exercise strict control over the designated area and all the buildings within. Thus, the Historic Areas department is currently in charge of the inventory of all the historic areas in the city and its metropolitan areas. This means not only the UNESCO designated center but also modern architecture and other historic areas that have been surrounded by the city as it has grown. A big part of my job during this internship was to control and supervise the updating process of that inventory. An information sheet was created and used as a form where all the information regarding historic buildings, churches, and areas was registered. Then different groups of architects researched every building and completed all the information of the forms including interior and exterior photographs, plans, elevations, and sections. My work then was to review every single form (5 to 12 pages each) and register any mistake and any incomplete information, do a report, and present the final product to the Historic Areas Commission for its approval. Here are some pages of the Inventory Forms! Another part of my job was to review and report on any project proposed in a historic building or in a historic area. Due to a specific regulation approved by the city’s authorities, any restoration, modifying, addition, or preservation project has to be reviewed and approved by the Historic Areas Department. Among many preservation and restoration projects both private and public, I was asked to review a few major projects including the adaptive reuse of a former psychiatric hospital (San Lazaro built in 1785), that will be transformed into a private university, three colonial houses that will be transformed into embassies, and two of the biggest housing projects in the city, which the municipality is proposing in order to get young people to live in historic areas through the adaptation of old colonial houses and their yards into modern apartments. Last but not least and probably my favorite thing, I had the opportunity to make suggestions and observations about all the policies, and physical elements used in both the inventory and the regulation procedures. I was asked to talk about New York as an example of how to manage built heritage and I was also asked to create a draft of the improvements that can be done to the major regulatory law regarding heritage in the city. All of these talks included not only the office that I was working in but also all the departments and municipal offices that deal with built heritage in the city, which means I was lucky to meet a great deal of experts that otherwise would have been difficult to reach. Overall the experience was remarkable not only because I got the chance to be home and to work in an amazingly restored building right in the middle of the historic center (close to all the good cafes and traditional candy stores), but also because I could finally put into practice what I have learned and furthermore I was able to see how my New York experience has shaped both my professional profile and the way I experience Quito’s built heritage (I love it! ).